Civil society in Lesotho works in a climate of considerable political instability. Recent years saw an attempted coup in 2014, the killing of a prominent military leader by other military personnel in 2015, and the fleeing of leading opposition figures to neighbouring South Africa and opposition boycotts of parliament in 2015. On 9th August 2018, an ongoing strike by a worker’s union composed of security guards, factory and general services workers escalated into protests in Maseru. During the protests which were held at the Thetsane Industrial Circle and at Maputsoe, the worker’s union expressed their disappointment that the Ministry of Labor and Employment had failed to address their grievances, including a 15 percent wage increase. Protestors blocked the main road and burnt tyres. The protests resumed on 14th August as factory workers gathered at Thetsane industrial area, outside Maseru demanding increased wages. The demonstration however quickly descended into chaos after police fired rubber bullets and used water cannons to disperse the protestors. The protests continued on the following day, on 15th August, as the factory workers staged yet another demonstration in Maseru near the Lerotholi Polytechnic Institute, while others blocked traffic on Moshoeshoe Road. On 21st August, it was reported that protests by the factory workers resumed in Maseru. The protests were staged at Thetsane Industrial area after which protestors marched on Moshoeshoe Road toward Kingsway. Gunfire, burning tires in streets, and incidents of vandalism were reported amid a heightened security presence, as military and police personnel were deployed to the area. According to local media, the factory workers have been on strike since 9th July - when the government failed to meet the workers' 14-day ultimatum demanding increased wages. In other developments, on 1st August 2018, women protesters in Lesotho joined their South African counterparts to march against gender based violence, as the #TotalShutDown protests spilled over to Lesotho. The protestors gathered at Setsoto Stadium and marched to the historical Sefika Sa Moshoeshoe in Maseru. As previously reported in the CIVICUS Monitor, the month of August is commemorated as the women’s month (in South Africa), where issues such as gender-based violence are highlighted. On 26th July 2018, it was reported that female opposition members from the Democratic Congress (DC) and the Lesotho Congress of Democracy (LCD) gathered at the Manthabiseng Convention Centre to protest against the Thomas Thabane-led administration, carrying placards outside the conference centre which was hosting first ladies and delegates from other countries who were attending the 12th Stop Cervical, Breast and Prostate Cancers in Africa Conference and Exhibition (SCCA) conference. The protestors decried the government’s failure to address several issues including the June 2017 murder of the former First Lady, Lipolelo Thabane and the disappearance of Makarabo Mojakhomo, a suspect accused of defrauding the First Lady ’Maesaia Thabane Trust Fund. According to authorities, Mojakhomo allegedly escaped police custody on 31st May, two days after she was arrested by the police. 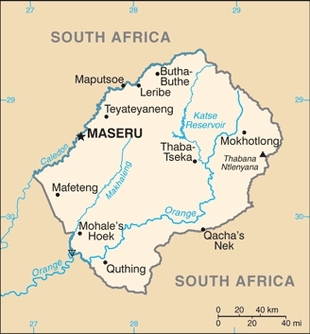 Her family however disputed this narrative and expressed fear that she had been subjected to enforced disappearance ‘due to the history and pattern of extra-judicial executions, enforced disappearances, torture and other ill-treatment in Lesotho’. On 12th September 2018, King Letsie III suspended Chief Justice Nthomeng Majara following a recommendation by Prime Minister Thomas Thabane. Civil society organisations have considered the suspension to be political motivated, as it went against two High court orders which prohibited the Prime Minister from taking any measures against the Chief Justice or recommending to the King, the suspension of the Chief Justice pending the full determination of an ongoing court case. According to Amnesty International, the suspension of Majara follows recent persistent attacks on the judiciary, the office of the chief justice, the minister of justice, Attorney General and the Lesotho Law Society, by the authorities. Between November 2017 and June 2018, Chief Justice Magara has been subjected to several attacks from government authorities, including a public statement on 9th December 2017 by the Minister of Law and Constitutional Affairs, Mr Lebohang Hlaele MP, in which he accused the Chief Justice of political bias and corruption and threatened that she should resign or face impeachment. The Constitution, in Article 16, protects the freedom of association, with reservations on the grounds of defence, public safety, public order, public morality and public health. The Constitution, in Article 16, protects the freedom of association, with reservations on the grounds of defence, public safety, public order, public morality and public health. Both domestic and international CSOs are generally able to operate without restriction, and many CSOs speak out on key social issues and on matters of corruption. In a landmark moment, after considerable delays, an LGBTI CSO was registered for the first time in 2010. However, trade union organising can be more difficult: public sector workers, who make up a large proportion of the workforce, are not allowed to form unions, and workers in the textile business, the country’s largest formal private sector employer, also experience difficulties in joining unions. Article 15 of the Constitution upholds the right of peaceful assembly, subject to limitations on the grounds of defence, public safety, public order, public morality and public health. Article 15 of the Constitution upholds the right of peaceful assembly, subject to limitations on the grounds of defence, public safety, public order, public morality and public health. However, in practice, protests have sometimes been violently dispersed, with reports of police brutality against assemblies in election periods. The police used live ammunition to disperse a strike by nurses in 2014, injuring some of those involved. In some parts of the economy, such as mining, union meetings are banned, while spontaneous workforce protests may be chilled by fear of punishments, including sackings. Article 14 of the Constitution recognises the freedom of expression, except on the grounds of defence, public safety, public order, public morality, public health and protecting the rights and reputations of others. Article 14 of the Constitution recognises the freedom of expression, except on the grounds of defence, public safety, public order, public morality, public health and protecting the rights and reputations of others. There is no government restriction of internet access, although poor infrastructure and high cost present barriers. There is a lack of clear and rights-based legislation on the freedom of expression. While the practice of independent media making criticisms of the government is well established, the government is sometimes intolerant of criticism and antagonistic towards private media, and the state broadcaster takes a generally pro-government line. The fear of losing government advertising, an important revenue source given the state’s central role in the economy, may also cause private media to self-censor. There have been several reports of government and military interference in the media, and police and judicial harassment and intimidation of journalists. Broadcast media were jammed during the 2014 coup attempt, and in 2015, two journalists fled Lesotho. The editor of the Lesotho Times newspaper survived a shooting in 2016, prior to which he and colleagues were subject to a long campaign of judicial harassment. Defamation and insult remain a criminal offence, and other laws, such as the Sedition Proclamation and Internal Security (General Act) may encourage self-censorship. The Sedition Proclamation in particular bans some forms of criticism of the government, and can lead to charges of seditious libel. The government rejected a 2015 recommendation from the UN Human Rights Council Universal Periodic Review (UPR) recommendations to repeal criminal defamation laws. There is no access to information law.